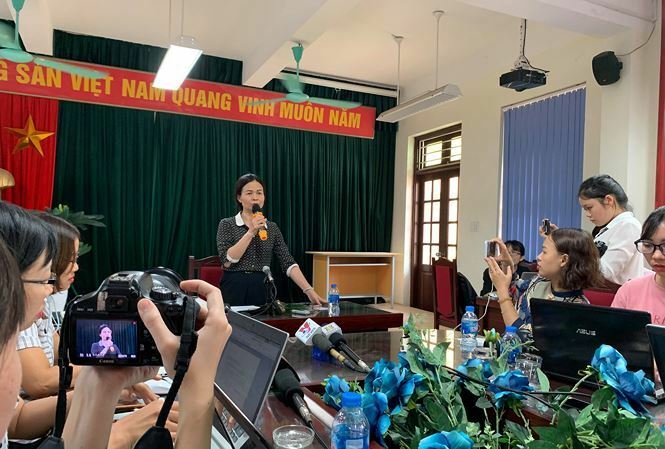 On Thursday, Tran Phu Secondary School held a press conference which lasted for just 15 minutes on the sexual assault accusations against a teacher from some parents. The school headmaster Ngo Thi Thu Anh reported that the accused teacher whose name has not yet been disclosed had been suspended from work while they are conducting an investigation. She, however, refused to answer reporter questions about the case, saying that the incident was still under investigation, so, the police had asked the school not to provide any information to the press. On Wednesday, some local newspapers published information about the incidents involving seven boy students. On the same day, the Ministry of Education and Training urged the Hanoi Education and Training department to investigate the case. Under the ministry’s instruction, the teacher needs to be suspended from the work during the investigation. At the press conference, Anh said that she worked with the parents of one among the seven students selected for a maths class trained by the teacher. "The teacher said he just wanted to tease the students, not sexually abuse them," she said. According to the headmaster, the school told the district’s Board of Education and Training about the incident and would co-operate with agencies on the investigation. This teacher has been working at the school for 21 years and chosen for the maths class because of his senior experience.